Just working on this new design for a client in Hertfordshire…..
Ultra contemporary modernist architecture was the brief for this job! We are proposing to use a crisp white render on a carrier board for an ultra smooth finish combined with grey powder coated joinery. We are also thinking about using some stainless steel strips around the building as well as perspex panels. This will make a refreshing change to the usually used cedar boarding etc.. 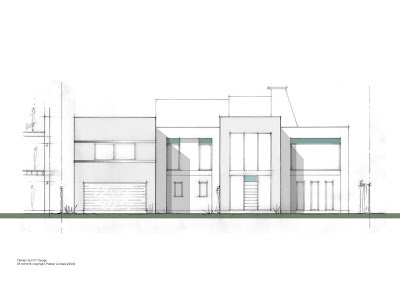 In terms of planning, this will be the only truly contemporary house within the street so i am sure we will have a battle on our hands but i think we may be able to sell the concept to the planners during our renowned and succesful pre-application strategy. “If you want progression, you gotta move forwards”! Check out the main features on page 98 which feature my two partners Potton Ltd and Oakwrights and also my own feature “In Focus” article on page 126 where I explain the design implications associated with your chosen method of construction. Potton also feature one of their recent Bespoke projects on page 100 and Oakwrights have a full case study of a great build in Kent done by Steve and Sheila Best…… great stuff! Its H and R roadshow time again folks! I will be with the Oakwrights crew on Saturday and Sunday this weekend at Sandown Park, Esher, Surrey. I have done this show many times before and its a really good one. It also has the added benefit this year of a dedicated kitchen and bathroom exhibition. Most of the magazine experts will also be there so if you have a question about pretty much anything (to do with building of course!) then come along and say hello. 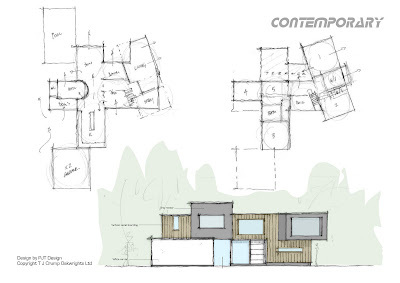 Plans are now well underway for my very own little build project!…. We start next week on our much needed kitchen extension here at the cottage. Having already extended the place a few years ago, the galley kitchen is just too small for us so i have designed a nice little side extension which will give us a space triple the size of what we have now so will be well worth it. I have based it on very simple barn architecture and it will present the house in a really interesting way and echo the pattern of development often found on houses that have been extended or altered over a long period of time. I have been advising my clients over recent years about the importance of a good sized family kitchen as we are definitely changing the way we live within our personal environment and at last, my own advice has caught up with me and now its my turn! Happy days though and i will blog updates as they happen! 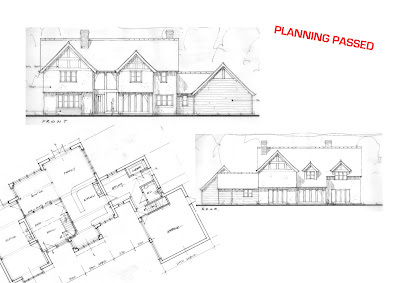 ANOTHER PLANNING SUCCESS FOR PJT AND OAKWRIGHTS! Looks like we have done it again! This permission was eventually granted earlier this week. It is in a lovely Suffolk village and within a Conservation Area. All in, it has taken us nearly 2 years to get this permission through! This was largely due to its location but also the council got a little carried away with the presence of trees and their root protection zones and things did drag on a bit. We used some excellent tree consultants in the end and managed to design the house around the trees rather than working against them. Congratulations Mike and Lee!….. we got there in the end. This is a really great project that we have been working on since late last year. It is in a Conservation Area and involves the demolition of the current property which we intend to replace with 2 houses. The site already has permission on it to do so but our clients wanted to do something more traditional and in keeping. 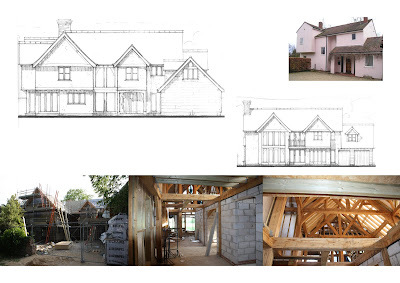 The scheme is based on 2 Oakwrights frames, one being a barn style and the other more of a traditional Cambridgeshire farmhouse. The clients are really switched on to exactly what they want and have a good understanding of architecture, materials and finishes and i know they will make a fantastic job of it. We will post further details soon! ANOTHER OAKWRIGHTS BUILD COMMENCES IN CAMBRIDGESHIRE! This is a really great result for us and Oakwrights…! 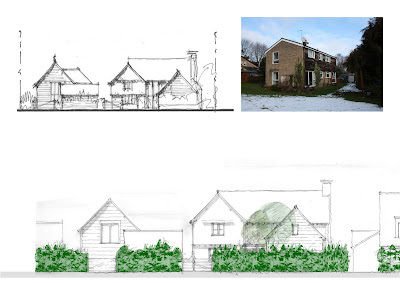 We managed to obtain (after 1 year) full planning permission for the demolition of the existing dwelling on site and its replacement with a fantastic bespoke design. 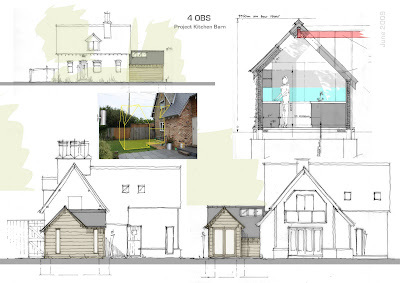 The site is in a Conservation Area where demolition is normally resisted but due to the fact that it was a bespoke design and we were praised for the high level of design, planning was duly granted and the clients are now well on the way! The house sits on a fantastic plot with views to one side of the River Cam and the front faces the village green so its just one of those really special plots that come along from time to time. The clients have been absolutely fantastic and are really focused on producing a great home. Now this we do like!!….. This is a job we are designing for a client at the moment who wants to go for oak frame but requires full on contemporary design! These images will form part of our pre-application strategy whereby we will present the scheme ahead of a formal application to enable us to collectively shape the proposals involving the councils planning department right from the start. A combination of crisp white render, grey render, vertical oak planed boarding and potentially a zinc/sedum roof will really look the part. Fingers crossed on this one and will keep you updated!